Jesus often uses images from farming in his teachings because they were so easy for his listeners to understand. This morning, however, he uses the familiar (to us) parable of the seed falling on different kinds of soil (MT 13) and his disciples question his use of parables (harder sayings). He goes into a long explanation of those who have eyes but do not see and ears but do not hear, etc. It seems he is trying to get people to think more deeply – not just with their heads but with their hearts. Living outside a city has made me increasingly aware of the subtleties of nature. The soil quality is important as we found after having planted a bush in one place and watched it do practically nothing for six years. Since we had planted it as a memorial for my father I was hesitant to give up on it. Finally, we moved it to a different spot – in different soil – where it now flourishes. And then there is the evergreen tree that seemed destined to stay the same size forever but suddenly grew to twice its size in one season. 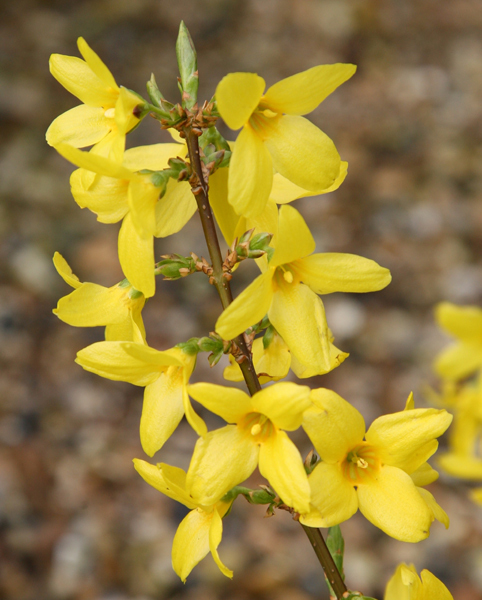 That reminded me to “trust in the slow work of God.” Occasionally, like this year, I am disappointed when my 30 forsythia bushes along the side of our property leaf out without having first displayed their glorious yellow and when the apple trees had few blossoms as well. It’s all due to the kind of winter we’ve had, I hear, but it’s hard to have such high expectation and then know that I will have to wait another year for the possibility of satisfaction. It’s a good reminder though that there are things in life that I cannot control and it’s best to accept the rhythms with patience and hope rather than just assuming all will be as I wish it to be.